Welcome to the island of lost toys and what many sportswriters have judged to be the softest matchup in the Western Conference playoff picture. Dallas made a couple of significant moves this season (both of them covered earlier on this site), picking up some of the league’s cast-offs in an attempt to go all-in for one more championship in the Nowitzki era. Whether that ends up as well for owner Mark Cuban as whatever is going on in that picture remains to be seen, but I’d say it would be a stretch for the Mavs to even make it out of their first round series with all their players intact. There’s been a lot of negative attention surrounding the Rondo trade and how one of the league’s most stubborn blockheads has the potential to ruin an entire locker room full of good-guy chemists. While Rondo’s numbers are laughably terrible (my roommates are looking over right now to see what the hell I’m cackling at) and there is a very real likelihood he will not be returning to D-Town next year after a falling out with coach Rick Carlisle, I think a lot of the concern with Rondo is misplaced. Yes, the dude cannot hit an open three pointer or even a free throw (!!! ), but the fact remains that even with the guard’s total lack of offense, Dallas’ offensive efficiency is still at a top tier 4th leaguewide, and the mercurial fellow is still averaging 8 assists and 6 rebounds in less than starter’s minutes. And while we have yet to see a really turned up Rondo shutting down the other end of the court, trading for him will have been absolutely worth it if he can find that next gear come playoff time and help slow down some of the Conference’s elite point guards. The true Knicks fan in me would be remiss if I didn’t at least mention Stoudemire’s potential impact on a playoff series. Amare has impressed in limited appearances with his new team, or at least has remained true to the gifted offensive player he can be, averaging over 10 points in 17 minutes over the last ten games. That he was willing to publicly shame his teammates after a particularly brutal loss can even be viewed as encouraging if you think that he already feels comfortable assuming a leadership role on a new squad and keeping his guys motivated. Rondo will definitely have more of a make or break role in the postseason, but a couple Amare explosions off the bench could swing a game or two, and will definitely have me rooting for these guys come April. There’s a reason I started this article off the way I did. Between Monta Ellis’ ballhoggery and Daryl Morey’s awful negotiating gamble on Chandler Parsons, almost all of Dallas’ starting 5 has been cobbled together from teams who no longer wanted these guys or weren’t willing to pay them (looking at you Tys!). However, like any rags to riches success story, these guys have found a real home here under Carlisle and are responsible for one of the NBA’s freest, most lethal offenses. Even during a down year, Dirk Nowitzki causes nightmare matchups for his opponents with his range and set of back-to-the-basket offense. Parsons is a swiss army knife on that side of the floor as well, able to pass, run the break, and shooting 39% from deep on the season. And Monta? Monta is one of the league’s more underrated heat check players, able to throw the team on his back with circus shots, off balance jumpers, and an approach to the game so unbelievably singular and aggressive that all of my friends have started calling it “Monta Basketball“. Yup, these guys are fun to watch. And oh yeah, let’s get back to Dirk Nowitzki for a second! I know this guy has definitely entered the twilight years of his career (an incredible one to be sure) but let’s not forget that the Mavs won a title four years ago with a similar cast of overperforming role players surrounding this transcendent talent. Sure he’s a couple years older and maybe more than a little tired finishing up his 17th season in the league (all on the same team yes! 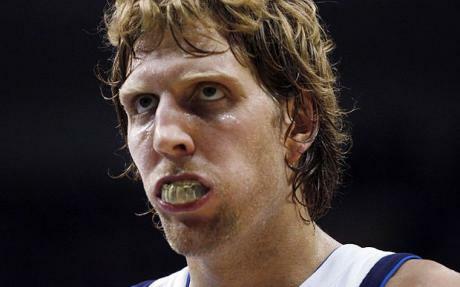 ), but Dirk has never been a guy who relies on strength or athleticism to hurt you. Simply put, this guy is one of the best pure shooters at his position, which is something that can work out for some old man basketball. Plus he’s trademarked one of the coolest signature shots ever!! For all the haters out there calling these Mavs the most vulnerable team in the West, I got three things to say to you. They still got Dirk. They still got Rick Carlisle. And watch that Spurs series from last year one more time. Boom! There’s that other side of the court popping up again. Taking a quick peek at the NBA’s regular season defensive statistics, Dallas is lucky to come across as average in any major category. 21st in points allowed per game (2 spots ahead of the Knicks!!) 15th in opponent’s FG%, 14th in opponent’s free throw attempts per game, and a ghastly, ghastly 27th in opponents’ 3 point % (yayy the Knicks are league worst in this category!). You shudder to think where these guys would be if they hadn’t grabbed Tyson Chandler over the summer. And realistically, outside of fantasy Rondo and 15 minutes a game from Al-Farouq Aminu, Chandler is the only plus defender on this roster. Ellis and Parsons are athletic enough to guard their spots, but the latter is a little too jumpy to stay focused while the former has to worry about carrying the entire offense whenever Dirk takes a seat. Dirk himself has always been a little flatfooted, too slow to keep up with a stretch 4 slasher like Blake Griffin and not quiiiite strong enough to tangle with a Zach Randolph in the paint. Carlisle has always been good about designing his systems to hide the inefficiencies of his older player but he’s going to have his work cut out for him come playoff time. These guys are going to get scored on. But are they the most vulnerable team in the Western Conference? Dallas is holding down the 6th seed and set for a first round meeting with Houston if the season ended today. That’s not great. I don’t have faith in any Maverick being able to contain James Harden, unless Chandler Parsons flips some ridiculous playoff switch and goes into full screw-you mode on his former teammate (yeahhh, naa). Tyson might be able to do a decent job on a banged up Dwight Howard, but facing Houston when we know that Dallas is already so awful at guarding the 3 point shot is a scary proposition. The Mavericks could always get lucky by overloading on Harden and forcing the other Rockets to beat them, but I don’t like that matchup one bit. Better by far for the Mavs would be if Portland makes up that half game on Houston to climb into the 3 seed. The season-ending injury to Wesley Matthews has made the Blazers’ attack very two dimensional, which might be an easier pill to swallow then MVP Beard surrounded by 3 point bombers. If Rondo can really earn his money next season with a vintage playoff performance in shutting down Damian Lillard, the Mavericks’ job becomes much easier in finding a way to throw two bodies at Lamarcus Aldridge at any time (Dirk is NOT gonna be able to handle that one on his own). And, while the Blazers defense has been very stout this season, I would give the edge to the free flowing, fast attack Dallas offense. Either way, its going to be a hard road for these guys, and they are not going to be favored against any first round opponent they draw. But if we’ve learned anything from the Spurs, you don’t bet against good coaching and you don’t bet against experience. Even when it’s not starting to look so good anymore.